Day after accusing Chief Minister Siddharamaiah of paying Rs.1,000 crore to the Congress High Command to retain the CM post, former Chief Minister B.S. Yeddyurappa, who is also the State BJP Unit President yesterday accused the Siddharamaiah Government of looting the State Treasury. Addressing a public meeting at the old bus stand here, he accused the Government of not recovering Rs. 18.5 crore from Minor Irrigation Minister Shivaraj Thangadagi even after corruption charges against the Minister were proved. Promises to waive off farmers loans: Presenting a rosy picture in the BJP coming back to power in the 2018 Assembly Polls, Yeddyurappa said that he would waive off farmers loan in full if the BJP was voted to power and accused Siddharamaiah of not bothering to waive off farmers loans even after many debt-ridden farmers committed suicides. 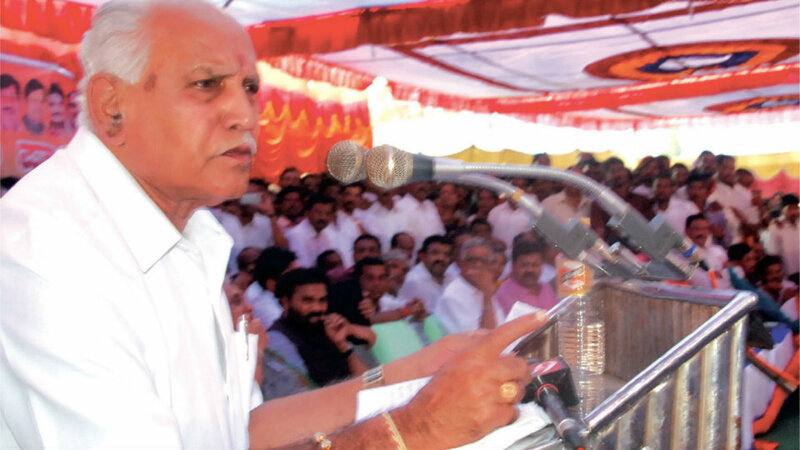 Stating that open condemnation of CM Siddharamaiah’s dictatorial behaviour by Congress leaders like Janardhana Poojary, A.H. Vishwanath and Jaffer Sharief were an indication of desperation in the Congress, the State BJP President said that many Congress leaders in the State were waiting to quit the Congress and join the BJP. Bike rally: Yeddyurappa, who arrived at the town was taken to the venue in a bike rally by over 300 students of Adarsh Vidyalaya located on the outskirts of Gundlupet. To drop another bomb shell: Yeddyurappa, who recently dropped a bombshell by accusing Chief Minister Siddharamaiah of paying Rs.1,000 core to Cengress High Command to retain the CM’s post, yesterday said that he would unravel the real corrupt face of the Siddharamaiah on Feb.12 by distributing hand bills containing the details found in the diary recovered by the Enforcement Directorate during a raid on Chief Minister Siddharamaiah’s close aide. Bypolls to be announced in a few Days: Yeddyurappa also told newsmen that the bypolls to Gundlupet and Nanjangud Assembly constituencies are likely to be notified in the next two days. It may be recalled that while Nanjangud seat fell vacant when Former Minister V. Sreenivasa Prasad resigned from the Congress, the Gundlupet seat fell vacant due to the death of former Co-operation Minister H.S.Mahadevaprasad.